SALISBURY, Md. -- The Delmarva Shorebirds are proud to partner with Market Street Inn and MoJo's again in 2017 to hold a toy drive to benefit Brooke's Toy Closet at Peninsula Regional Medical Center. Brooke's Toy Closet was started in 2014 by Brooke Mulford, a local girl who was diagnosed with neuroblastoma, an aggressive form of cancer, in January of 2009, when she was four years old. Brooke, unfortunately, lost her battle with cancer earlier this year on June 12th. Brooke's Toy Closet is a special cabinet filled with toys, coloring books and other goodies that PRMC's Emergency Department and Pediatrics Unit can give to children who are hospitalized. The recipients of these gifts will be able to use them when they're in the hospital, and take them home to enjoy when they are feeling better. 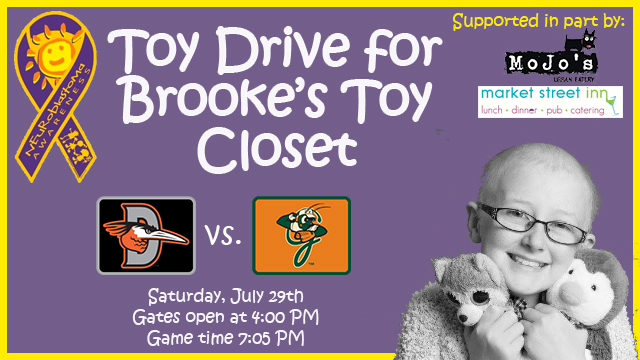 The toy drive will be held on Saturday, July 29th when the Shorebirds host their annual Christmas in July game at 7:05 PM against the Greensboro Grasshoppers. Gates will open at 4:00 PM so that fans can watch the Shorebirds and Grasshoppers take batting practice. The Shorebirds will be holding the collection in the Fun Zone outside the main gates of Arthur W. Perdue Stadium. Those who make a donation will receive a ticket voucher to a future 2017 Shorebirds home game, a $10 gift card to Market Street or MoJo's and an entry in a raffle to win another $50 gift card to each restaurant. The Shorebirds will accept new unwrapped toys, activity books, and other children's toy items. That night's game will also feature the Shorebirds wearing special Christmas-themed jerseys that will be auctioned off to benefit the Shorebirds Fly Together Fund and a postgame Q105 fireworks show presented by MoJo's and Market Street Inn. For more information on the toy drive, contact the Shorebirds at 410-219-3112.